How much of your time do you really spend glued to a phone, laptop, tablet or television? Research shows that UK adults now spend nearly half their waking year looking at a screen. Researchers are pouring thousands of hours into the side effects of this most modern phenomenon - assessing its impact on eye health, poor sleep patterns, and even premature ageing of the skin. So, what’s the solution? Increasingly common is the ‘digital detox’: a period spent avoiding online devices. Digital detoxing has been shown to offer a range of psychological benefits, including reducing anxiety and depression, increased sleep quality, improving relationships and boosting both productivity and creativity. It’s become so popular, in fact, that it’s now even possible to book onto detox retreats for enforced unplugging. Digital detoxes don’t need to be that extreme, however. Or expensive. The festive period is the perfect time to switch off - and here are ten ways in which to do it. You may think you don’t need a digital detox - but do you know how much time you actually spend attached to various devices? According to research, ‘we’ spend an average of four hours per day attached to ‘our’ smartphone alone. Want more accurate data? The QualityTime app creates an automatic diary of your daily smartphone usage habits - showing how many times you’ve unlocked your phone, the time spent on each app, app access frequency and more. Now you have a baseline to work from, and a target to set yourself. While turning your phone off and not looking at it is the most obvious answer to digitally switching off, we’re realistic: that’s unlikely. However, to help with your detox, QualityTime allows you to set usage limits for individual apps, along with a ‘Take A Break’ feature to force you to digitally unplug. Our advice? Start using such an app before the festive period kicks in: seeing the results earlier may well make it easier to focus on family time over Christmas. Access to a laptop means having the world at our fingertips - which in turn means digital temptation. This Christmas, try and avoid booting up your laptop at all. You may be planning on using it for a non-work-related purpose, but the temptation is too great to quickly check emails, LinkedIn messages and other corporate communications while you’re there, sucking you into behaviour that can be hard to resist. 36% of us check work emails over Christmas - but set your out-of-office reply and make it clear to customers, suppliers and colleagues that the holiday really is a work-free period. 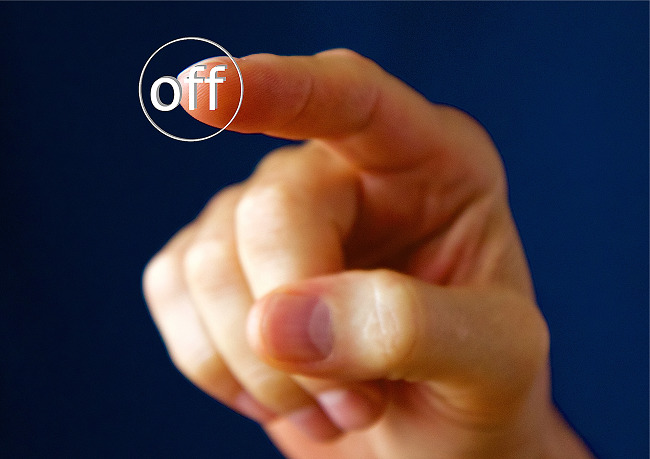 Keeping your laptop lid closed and the device out of sight for the festive break will allow you to truly switch off. Email, social media, WhatsApp, installed apps and now even websites we’ve previously visited all contribute to the plethora of notifications that we receive to our mobile devices each day - with every squeak, beep and vibration tempting us to pick up our devices. The stats say it all: studies show that push notifications have a 50% higher open rate and a click rate that’s seven times higher than email, monopolising our attention and demanding our time. What’s more, our brains reward us with a healthy shot of dopamine - the chemical which causes ‘seeking’ behaviour - whenever a push notification comes through, increasing our addiction to our mobile devices. Switch these notifications off, and you’ll notice yourself engaging far less with your mobile device. Mobile notifications are scientifically proven to reduce attention span - even without interacting with the device post-notification. The best solution? Switch it to silent - not vibrate. Even better, switch your phone to silent AND position it out of your line of sight: doing so, shows a University of Texas study, can improve your cognitive performance. Those who want to go to a greater extreme can support new product Pause on Indiegogo: a box for your mobile phone that blocks all mobile and internet signals, leaving you distraction-free. Navigating with Google Maps; Listening to Spotify playlists while out for a run; Checking emails while the kids are in the playground - it seems that we can’t spend a day out without relying on technology. But give it a go. Check directions before you leave, listen to the sounds of nature while running, and watch the kids playing instead of being face-down in a phone screen. 28% of parents say that their child spends two to three hours a day using tech gadgets each day: setting an example and showing that time can still be enjoyed without these distractions may help them, and you, to appreciate more traditional activities. Not only is tech usage at the dinner table considered poor etiquette (even Pope Francis has called for families to speak more at mealtimes), but it can be damaging to family life and interactions too. A survey shows that eight in ten families still see sit-down family meals as important, but one in twenty say family meals are lucky to last five minutes thanks to other distractions, with television and social media being the biggest culprits. John Sharry, CEO of parenting charity Parents Plus!, offers five tips to protect family togetherness at the table, including involving the whole family in meal prep, and starting with just one tech-free family meal per week if there’s a need to go completely back to basics. Music has been proven to have beneficial effects on stress levels - so consider switching from an evening spent bingeing on Netflix box sets to one spent relaxing and listening to music. Many of us choose to listen to our favourite songs via YouTube or Spotify, or while simultaneously staring at a screen - instead why not try switching off, closing your eyes, and listening more actively? Active music listening is more therapeutic than staring at a screen - and can even improve our intentional listening skills, vital for successful business leaders. Games consoles, tablets, laptops and mobile phones are always high on Christmas wish lists. But do these devices really foster that sense of family spirit that Christmas should be about? If you switch off, you’ll encourage the rest of the family to do the same, as long as there are alternatives to keep everyone entertained. Stuck for ideas? There are plenty of round-ups of the best new favourite board games out there, like this. Playing board games isn’t just a fun activity for the family to enjoy - it’s one that studies have also shown can help to stave off Alzheimer’s and dementia too. If you want to carry the digital detox through to the office too, we love the concept of India’s The Board Game Co., where owners Krunal and Jill Veera encourage workplaces to play board games - including some of their own design - to enhance skills that benefit both the office and day-to-day life. Christmas is a time for making memories, and it wouldn’t be the same if we didn’t capture these on camera. If you choose to use your mobile phone camera, it may be time to try a different tactic: before you know it, you’ll have scrolled back to look at the pictures you’ve taken, shared a few on social media or email, and become distracted by the numerous notifications or messages that are vying for your attention. Instead, switch to a standalone camera - whether digital or film-based - that will force you to focus purely on the pictures, without any other distractions. You’ll also find that a standalone camera has positives such as better battery life, more control and lens versatility, so your photos could benefit too. With Christmas films and the Queen’s Speech, Skype or Facetime calls to distant family and more, it would be pretty difficult to avoid screens entirely for the entire festive break. If you want to watch the Eastenders Christmas special, don’t feel guilty: a digital detox is about improving your work-life balance and mental health, rather than adding extra pressure. And extra pressure is one thing we certainly don’t need at this time of year, with research showing that even high street Christmas shopping can raise your heart rate by 33%. Set yourself achievable aims over the Christmas period - manageable, realistic goals. Chances are, even cutting down rather than cutting out screen time completely will help you to re-evaluate your priorities, enjoy family time more, and leave you feeling refreshed and revived for the start of the New Year.